Once I got married and the need to feed the spouse (and myself) became a priority, I realized I had to invest in the right kind of kitchen tools. And it all begins with a good set of knives. Initially, we had a set of serrated knives, and cutting through meat and even some vegetables was a tedious chore, not to mention the fact that the meats were almost always ruined at the end of the task. After much research, I came across J.A. Henckels International Forged Premio 13-piece block set. Although I did feel the set was out of my price range, I gave in based on the quality Henckels is known for. Besides, I did not want to keep shopping for new knives every few years. The blade is not made in Germany because the set is not part of Henckels top line of German made knives. However, this is probably the best out there for amateurs like us who cannot fully appreciate the beauty and character of a $150 (or more) Zwilling. The Premio does have a professional air about it. The stainless steel blade provides clean and precise cuts and slices. I’ve been using these knives for a few months now, and having gotten quite a few cuts and nicks myself, I will attest to their razor sharp edges. A general reminder: even if the product description says it is dishwasher safe, it is always best to hand wash and dry your knives immediately after each use. It goes a long way in maintaining the longevity and sharpness of the product. But yes, the knives are dishwasher safe. When I buy a product, it must fit in well with the general aesthetics of the room. The J.A. 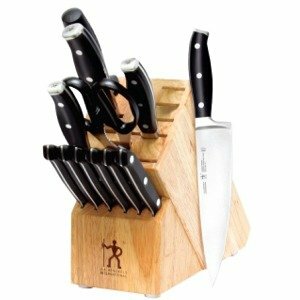 Henckels International Forged Premio 13-piece block set adds just the right amount of modern touch to the rest of my kitchen. A quality product with the right price tag, this is the perfect knife set for you or a loved one.